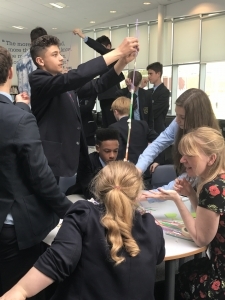 As part of The Nobel School’s Year 10 enterprise day, 40 students with little exposure to people in a variety of jobs were selected to take part in an employability skills session. Five former students, from a CEO to a Paralympic gold medalist turned rowing coach, helped students develop key skills for the future. The morning kicked off with some inspirational stories, as alumni described their journeys since leaving school. One former student started her career on a Young Enterprise scheme and went on to open her own tie-dye t-shirt business. She described how university was ‘alien’ to her family so she didn’t go straight away. Now she is studying for her Masters. She told students: “You can choose your own path if you want to. Be proud of yourself, channel your own positivity and let that drive all the other things you do. 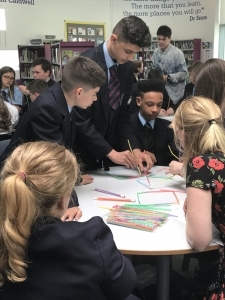 Alumni worked with students on a series of activities to identify important life skills, such as effective communication, organisation and the ability to stick to deadlines. After the session, one student told us: ”I’ve realised that we are learning these skills in every single subject at school”. 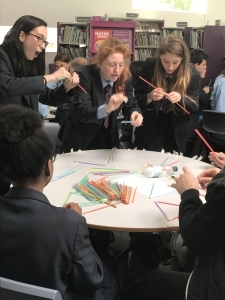 Students got a taste of team work, problem solving and planning when, led by alumni, they were tasked with building a tower out of drinking straws. Afterwards, 94% of participating students said they were more confident or much more confident about being successful in the future. One student said the session had taught them to “never give up and focus on [their] aspirations”.